Rate the Dress: Princess worthy summer whites? Last week I showed you a very brief (from a historical perspective) 1920s Jean Patou dress with heavy beading and a bit of an Egyptian twist. You generally agreed that the mannequin wasn’t doing the dress many favours, but after that your opinions diverged: some of you thought it would have been so much better in bolder colours, some of you though that the restrained colour scheme was all that kept it from being garish; some of you though the dark beads were off, some thought it was exactly what the dress needed. Most of you thought that it was complete perfection, and the dress came in at 8.9 out of 10, just a hairs breath away from making a perfect 9. 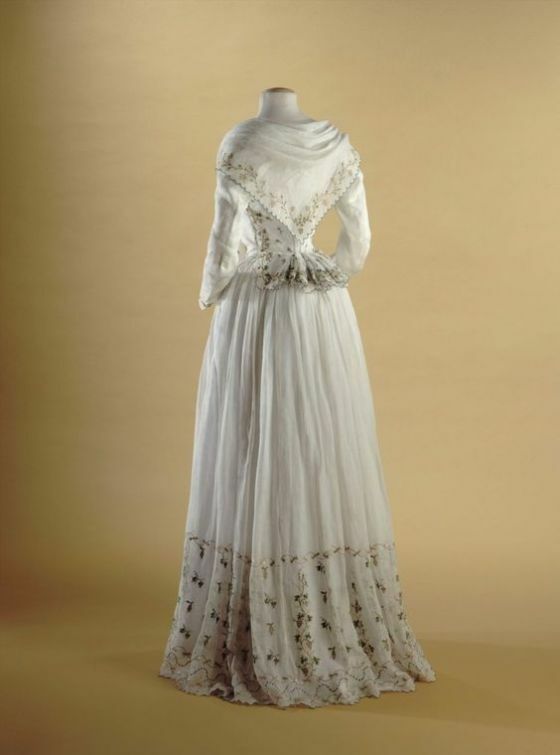 UPDATE: a historical costumer involved in the exhibition of this dress at the Palais Galleria informs me that it has NO provenance Madame Elisabeth. I’m leaving the blog post mostly as it was, so as not to sweep the mistake under the rug and cause confusion. I’ll remove any reference to Madame Elisabeth in the photo comments, to help prevent the misinformation from spreading via pinterest, etc. If you see any further photos with the attribution to Elisabeth, please help to correct the record. This week, let’s move from silk to cotton, and from beading to embroidery, for a dress that sounds much simpler, but has an even more illustrious pedigree. This ensemble is an excellent example of the transitional styles of the 1780s and 90s, as fashions moved from the structured bodices and more elaborate fabrics of the Rococo, to the softer silhouettes and lighter fabrics of the turn-of-the-century. The very fitted caraco bodice, with its boned front lacing, harkens back to older fashions. The embroidered details on the bodice evoke zone front bodices, and the pockets on men’s waistcoats. The ruffled pierrot tail of the jacket, with its elaborate embroidery and delicate edge finishes, emphasises the fashionable pronounced rear of the silhouette. 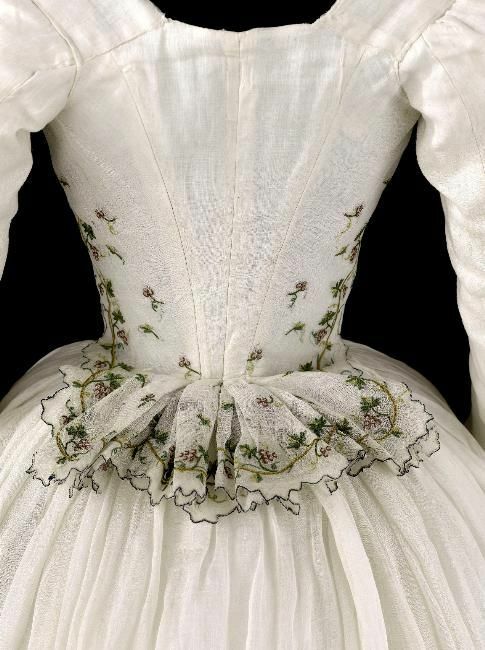 The ensemble was displayed in an exhibition on Madame Élisabeth at Versailles, along with a matching fichu, softening the severe neckline of the dress. What do you think? Princess worthy? Oh my goodness, this is perfect. Seriously, perfect. I love the fabric- so light and gauzy, with the perfect balance of structure and drape. It’s also beautifully preserved- the embroidery is TO DIE FOR. Perfectly summery, feminine, elegant, and relaxed all at the same time. Delightful! I’m usually not much of a fan of transitional styles, but I adore the way this balances the soft classical regency styles and the stiffness of earlier times. This is one of those rare pieces that can win me over. On another note, I’m wondering when cotton moved from being rare and precious to cheap and ubiquitous. I know earlier in the century cotton was more of a prestige fabric, but when did that change happen? Is it cotton for a display of wealth or just cool and comfortable? Anyhow, delightful. 10/10- the first time I’ve rated anything so highly. I will have to make this! 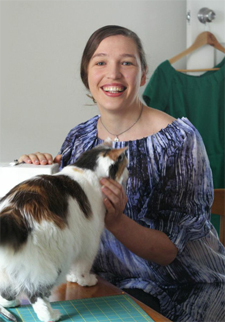 This dress is positive perfection! Not too much decoration, but just enough, and in the right materials to make it the perfect summer frock for a princess. This I love. It’s elegant, it’s graceful, it is beautifully summery. The embroidery is exquisite. And the shape is such that I could wear it! A perfect 10, for anyone, not just a princess. I can but echo the previous posters — perfection. It’s beautiful – and deceptively simple – a lot of work would have gone into this dress and the bodice would have been stiff and unyielding. Even so, it gives off an air of simplicity and comfort (as though this is the 18th century’s version of a light summer frock.) I think it’s wonderful and absolutely fit for a princess! Oh my. It really look my breath away. This is an example of transition with skill…. 10/10. I would give 11 if I could. 10/10. Just exquisite. Beautiful workmanship, not a design or technical element less than perfect. I love the bouffant skirt in the first pictures, and the fichu in the last picture. The muslin does look a bit like cobwebs, albeit rather pretty, clean, white cobwebs. The embroidery is lovely, if a touch wishy washy and strangely unsure as to whether it wants to be geometric or meandering. I think I will say 7.5/10 overall. What a lovely garment,summery airy…what is foundation garment that that creates that silhouette? Beautiful! I like that it’s got that overall simplicity of the white muslin, but with the complexity of the embroidery & ruffles keeping it interesting. I’m a sucker for a matching fichu, too. 10/10 with the fichu, 9/10 without, because the bare neckline doesn’t really match the delicacy & proportions of the rest of the garment, to my mind at least. It’s quite beautiful. I love everything about it, except the front embroidery. It’s too linear and contrived, especially compared to the lovely natural flow of the back embroidery. 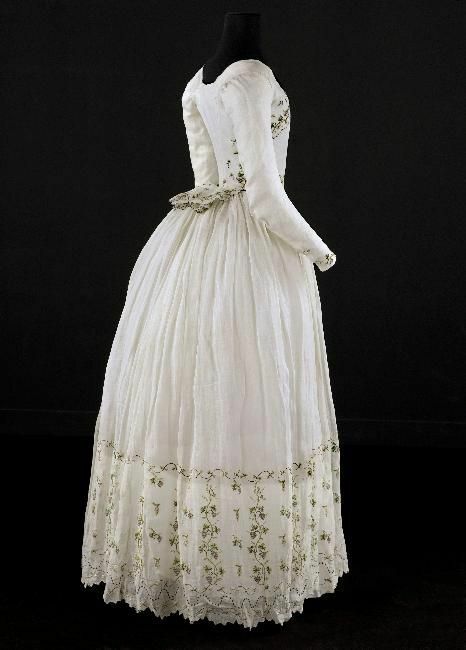 I also much prefer it without the fichu-the neckline is perfectly dramatic and would look amazing on a real person. The fichu just takes it into Disney territory (boring!). I will give it a rating of 8.5/10 without the fichu and 7/10 with the fichu. I would give anything to see the hairstyle she wore with this dress. The perfect hairstyle would be the ultimate finishing touch here. 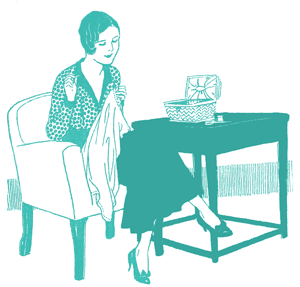 I have perhaos a very silly question: is there a connection between fichus and the silk triangle and square scarves so loved by French women to this day? Or is it just a case of recurring trends? I think that’s just a case of recurring trends. 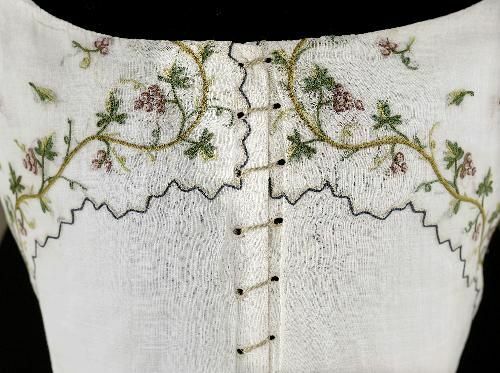 Fichu were just as popular in England in the same timeperiods, and there have been many decades since when scarves were not at all a feature of French fashion. Yes. Perfect! 10 out of 10. I really love this, especially how light it seems. Most cotton dresses seem so much more sturdy, this is almost ethereal. 9 out of 10. That muslin is terrifyingly delicate; I wonder how they made it safe to display it without it falling apart. I am almost too scared to stare at it! I love the back view, that frothy pierrot tail is just so delicious. I am not as keen on the placement of the front embroidery. But only because it is otherwise to exquisite. It’s beautiful and I love it. Totally impractical of course, but a princess doesn’t need to think about getting dirt out of whites. I, too, give it a 10 out of 10. I hope it made her happy and that she loved wearing it, because 1789 was the beginning of the French Revolution and the beginning of the end for the royal family. She was guillotined some time after Marie Antoinette. I love it! I just think it’s so crisp and fresh looking. 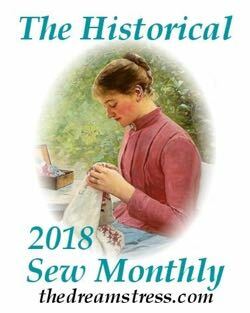 It would be so wonderful to wear that and feel the beautiful and delicate muslin between my fingers as I raise it just so slightly to sit down. If the princess didn’t wear this whoever did felt like one, I’m sure! The embroidery…wow…and the seam finishing on the Pierrot tale..brilliant! I also have to say how much I love the uniqueness of the laced front! 10 outta 10 for certain! I actually really like this dress but the front lacing is just not working for me, especially since the Galliera used the most rough-looking lacing they could find for it. (Maybe a white silk ribbon would have softened the look of the lacing.) Also not a fan of the pseudo-front pockets embroidery. The placing and general existence is somewhat awkward. Still a 9/10. I suspect, R, that the fichu could have been draped to hide all or most of the lacing. Also, one could have always chosen something different to use instead of the odd cord that appears in the museum’s photos. Absolutely stunning! I admit I’m biased as the late 18thc is my happy place, but I definitely would call this princess-worthy! I’ll give it a 9/10; only the slightly odd-to-my-eye “pocket” embroidery keeps it from perfection. While I don’t like the long, pinched waist, there isn’t much else I can complain about. It’s light and airy (maybe a little too plain? maybe? ), and I love the frothy tail on the jacket. The dress’ simplicity is lovely, but there’s nothing (aside from the tail; and the shape of the skirt) that makes me rave over it. I think this dress could look insipid on one person and blazingly elegant on another. SOOOO pretty– but I think it could be possible that one could be better? If I could give it a 9.5 I would, but since I know you will nix that, I give it a 9. Saving the best for another time. 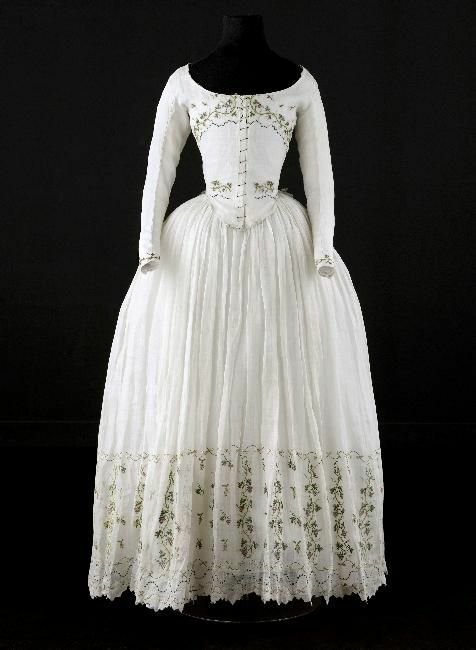 By the way, I think that the fichu is what raises this gown to perfection! As the Dreamstress pointed out, it softens the “severe neckline”. 8/10 Perfect back, the front a bit too severe – it looks too strained in this delicate fabric. I love the back, the front of the caraco is a little severe. The skirt suggests a … dare I say the C-word (“Curtain!”). Poor Mme Elisabeth, one wishes she could have died peacefully in her bed at the age of 83. Thank you for that correction! 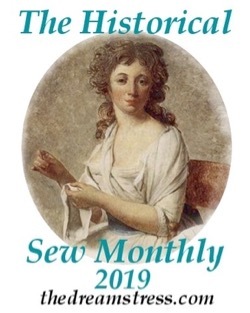 The attribution to Madame Elisabeth has been widely disseminated in the English language costuming world – I’m sad to hear it’s a myth that I’ve unwittingly perpetuated. I’ll update my post, and hopefully be able to do a little bit to set the record straight.